Oozefest, UB’s annual mud volleyball tournament, celebrates its 35th anniversary on May 4. The event was created in 1984 as a way to help students bond and de-stress before exams. Jim Gerace wasn’t sure what he stumbled across on an overcast April day in 1985. His editor at The Spectrum needed someone to cover a mud volleyball game –– the second of its kind –– despite the cold Buffalo weather. Gerace flipped a coin with another photo editor to see who would be stuck with the task. He lost the coin toss and ended up seeing shirtless students slide through mud pits head first, with blood all over their legs. “This” was the beginning of a UB tradition. He witnessed the second-annual Oozefest. The yearly tradition began as a way for the UB community to come together and de-stress before exams. Oozefest originally included 16 volleyball teams and has since expanded to 192 teams. Oozefest is the largest collegiate double elimination mud volleyball tournament in the country. This year’s tournament on May 4 marks the tournament’s 35th anniversary. Oozefest is known for its strong alumni presence, with teams made up entirely of former students. For many past students, participating in Oozefest was a highlight of their college experience. Elizabeth Davenport and Franca Dusse participated in Oozefest in 1992. The two recalled how cold the mud was and the feeling of losing their shoes in the pits. “[I lost] my shoes as soon as we walked in. I had to hold on to my pants or I would have lost them too.” Dusse said. The university recommends that students duct tape their shoes and clothes to their bodies to avoid losing clothing. It also recommends leaving valuables like cell phones, wallets and sunglasses at home, to avoid damage. Oozefest preparations begin during the fall semester. Maintaining the mud pit for each year’s Oozefest is a part of the preparation process and Facilities cleans the mud pit for debris, like sticks and rocks, before students get to play. The team tasked with cleaning the pit this year has to also anticipate debris from the University Bookstore roof. Pieces of the bookstore blew across Lake LaSalle and reached the Oozefest mud pits earlier this year during a windstorm. Jude Butch, the senior associate director of student engagement, said the pieces of the bookstore roof will not impact how UB prepares the field. Butch said this year’s tournament would take into account teams’ skill levels. This new bracketing system will pair similar skill levels together, to make games fair. But Oozefest is more than a volleyball competition. Every year the tournament holds a costume contest. Past themes include robots, wedding dresses, minions and pirates. Butch said he expects to see a lot of students dressed up as Star Wars characters this year because of the May 4 date. Butch said Oozefest is a spectacle undergraduate students shouldn’t miss and feels that every student should participate during their time at UB. “It's one of those things, that is kind of a bucket list thing that everybody should do … like, before I graduate, I'm going to do this at least once.” Butch said. Davenport said she saw Oozefest as a bonding experience she would never forget. Her team was made up of students on her floor and the event brought them closer together. “We spent a lot of time with these people, but it was the ones crazy enough to do it that were on our team,” Davenport said. Julianna is the asst. 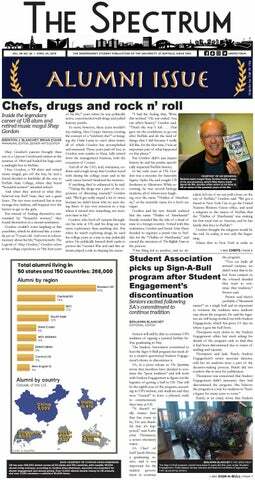 arts editor and can be reached at julianna.tracey@ubspectrum.com and on Twitter @JTraceySpec.